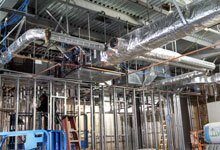 Houston duct work services provided by CAPS are always executed with exceptional customer care using top quality products you can rely upon. Call (713) 460-9009 to discuss your IAQ needs today. Schedule an appointment with one of our air quality experts for your commercial or industrial business air quality evaluation and recommendations. We provide regularly scheduled filter change outs, equipment filter rotations, cooling and process filtration, gas turbine, and media bed testing services. Need more images and info to differentiate between Commercial and Industrial below. Insulated interior/exterior (fiberglass, foam, poly, weather jacketing). Our full-service Houston duct cleaning service includes the option of participating in regular IAQ filter maintenance programs, including turnkey services to begin your program and have the confidence that everything is continuously taken care of from there out. Custom Air Products and Services works with a large variety of filter types to meet your business facility’s exact needs. The filter and maintenance programs that we provide include completely portable IAQ filter design, duct cleaning work completed at your convenience, coil cleaning, grease filters, chemical media testing, and modular design machines. Custom Air Products and Services is the indoor air quality company in Houston that you can rely upon to expertly manage all of the duct cleaning services for your commercial and industrial locations. Give us a call today at (713) 460-9009 and experience the top quality customer care that you will always receive when dealing with Custom Air Products and Services. HVAC Design-Meet Strict Energy Code Requirements. HVAC Fabrication- HVAC Units Manufactured to Meet Your Specifications.